If Instagram is the home of Throwback Thursday and Flashback Friday, #IGers should think of today as Word to the Wise Wednesday. We’ve been spending some time on Instagram lately. Why? Because advertisers, endorsers, and consumers are spending time there, too. What we saw raised concerns about whether some influencers are aware of truth-in-advertising standards about endorsements and disclosures. So the FTC staff sent 90+ letters to celebrities, athletes, and other influencers – as well as to the marketers of brands the influencers endorsed. Our goal is to influence influencers to comply with those established principles in their Instagram posts. According to the FTC’s Endorsement Guides, if there is a material connection between an endorser and an advertiser, that connection should be clearly and conspicuously disclosed unless it’s already clear from the context of the communication. What do we mean by “material connection”? It’s a connection that might affect the weight or credibility that consumers give the endorsement – like a business or family relationship, a payment, or the gift of a free product. The legal responsibility for disclosing the relationship between an influencer and a brand is a two-way street. Influencers should clearly let people know about that connection and marketers have an obligation to make sure they do – usually by educating their influencers and monitoring what the influencers are doing on their behalf. Make your disclosures hard to miss. In addition to what you say, consider where you say it and how it will look to consumers on the devices they’re using. People should be able to spot the disclosure easily. But if they check their Instagram stream on a mobile device, they typically see only the first three lines of a longer post unless they click “more.” And let’s face it: Many people don’t click “more.” Therefore, disclose any material connection above the “more” button. Avoid #HardtoRead #BuriedDisclosures #inStringofHashtags #SkippedByReaders. When posts end with a jumble of hashtags, how likely is it that people really read them? That’s why a “disclosure” placed in a string of other hashtags isn’t likely to be effective. 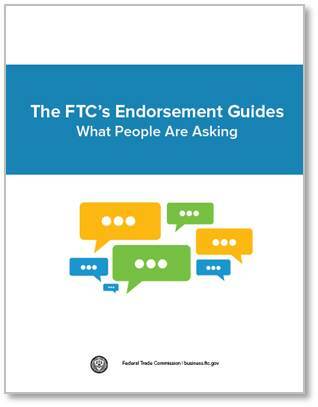 In addition to the examples in the Endorsement Guides, the brochure FTC Endorsement Guides: What People are Asking offers additional tips for influencers and marketers. Where can we report bloggers or influencers who are still violating these guidelines?